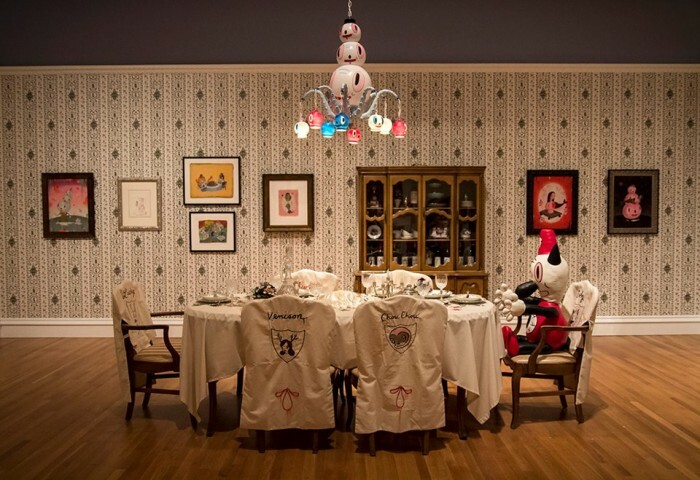 This weekend, a retrospective of the works of Gary Baseman titled The Door Is Always Open, opened, at the Skirball Cultural Center. 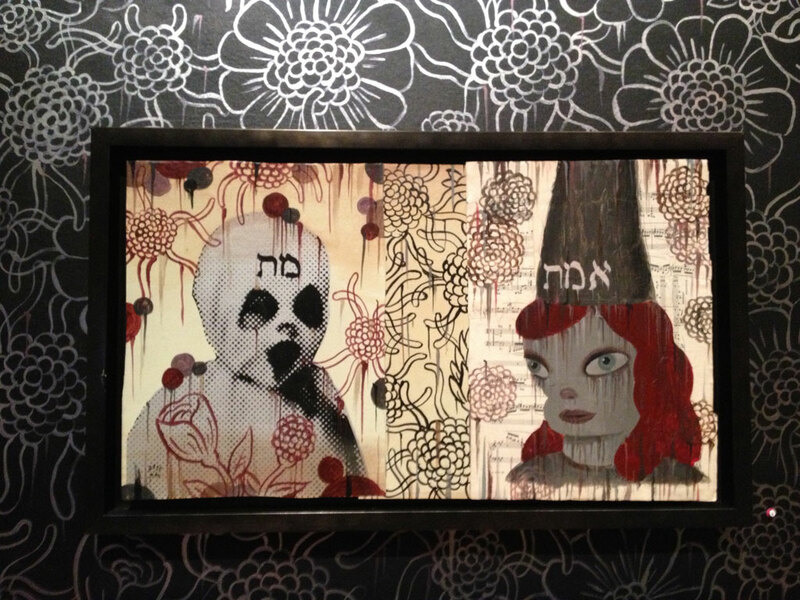 ‘Door’ recreates the artists’ childhood home filled with famous Baseman characters and Jewish subjects peppered about. 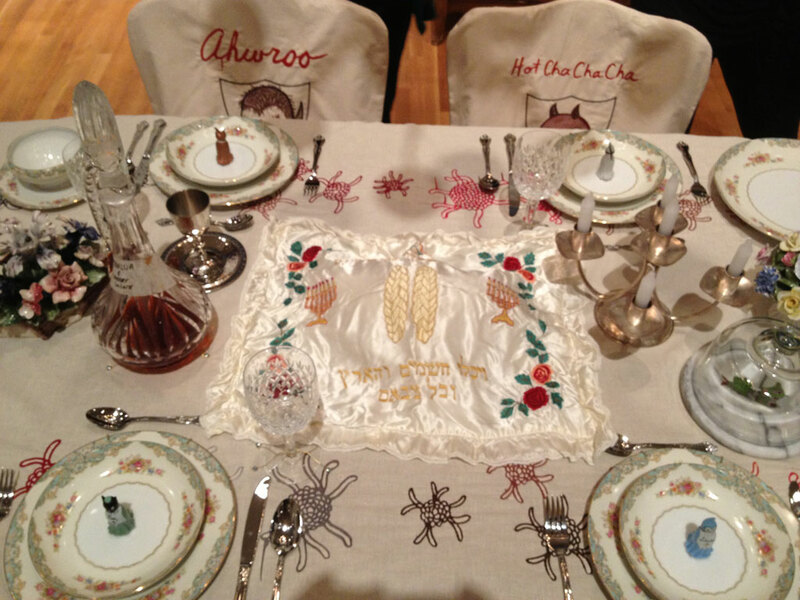 Gary Baseman's characters seated at a Shabbat Table. Baseman has had a long and successful career with iconic characters and big clients to fill his CV, but recent works are the first time he is dealing directly with his Jewish identity and the value that it holds for him now. This exhibition represents a major step in the artist coming to terms with his past and the many travels that he has taken exploring his art and identity. His work uses cute characters typical of animation to discuss serious issues. The paintings are imaginative and representational, with renderings of characters that look like they came straight out of a stuffed animal collection, except with an adult seriousness and more bodily fluids. Baseman’s work is indicative of the West Coast art scene identified as Pop-Surrealism or Lowbrow Art. This Los Angeles stylistic homecoming marks an appropriate meta commentary on the work’s themes. Diverging into editorializing, upon hearing about the exhibition without seeing any of the works, I was skeptical that there would be an obvious showing of Jewish identity in the art. We have previously posted works that Baseman created with Jewish themes, but I was doubtful that there would be enough of an emphasis on Jewish practice and identity in his life today that would be so apparent as to emerge this strongly. Many Jewish Museums celebrate famous artists who “happen to be Jewish” and have fond memories of growing up in a Jewish household. However, the connection to their heritage in the work itself is many times a stretch of the imagination. If this model is used to set an example of what is “Jewish art” then we may have already lost a battle for authentic expressions of tradition through art. We already have a plethora of famous artists of Jewish descent who don’t have any day-to-day experiences that cause them to interpret the world within a Jewish context. What’s more, many young artists growing up today in secular American society have less and less “Jewishness” permeating their households, so even that tenuous connection is disappearing. With all this preloaded skepticism, it was a breath of fresh air to be proven wrong about the Baseman show. What convinced me that there was an acknowledgement of authentic Jewish practice (going beyond gefilte fish in the exhibition) came when I found out there was a mezuzah hanging in the “house”. Naturally it was of the artist’s own design. And true to practice, it was dedicated at the opening of the show to serve as a sign on the doorway for all who enter. This is a Jewish home. A sacred space. To see so many people participating in this ritual, to be engaging with Jewish tradition in this way, was a true spectacle. 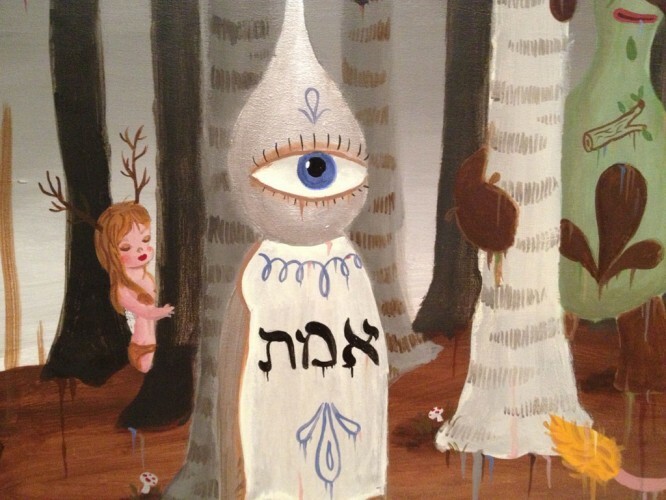 Jewish artist Isaac Brynjegard-Bialik was inspired by seeing Baseman’s Jewishly inspired work on exhibit, filled with Hebrew letters, ritual objects, and traditional Jewish foods, alongside photos of him at his Bar Mitzvah and with his family for Passover seders. It is rare for an established contemporary artist to spring into a Jewish phase of their work. Most Jewish artists who work with religious themes from their early careers on get pigeon-holed and largely ignored by the art world at large. Is this perhaps a path to follow for a later career turn towards tradition? Or the opening up of acceptance thanks to this artist’s own renown? Baseman’s inventive way of evoking his family’s past, and finding his own place in Judaism in the present, hopefully will spark other artists to express themselves by bringing their own culture and history to their work. Perhaps The Door Is Always Open will open doors for other artists on their own paths to expression. “Gary Baseman: The Door Is Always Open” continues at the Skirball Cultural Center through Aug. 18. For more information, visit here.